The Faculty of Commerce and Management at Hitotsubashi University launched the Shibusawa Scholar Program in order to foster individuals capable of embodying the university’s ideal of “Captains of Industry” in a global environment, regardless of differences in nationality and language. Beginning with students enrolling in the faculty in the 2013 academic year, each year around 15 students are selected to participate in the program from their second year of undergraduate studies. Participants take a range of courses designed to cultivate the skills of logical thinking and analysis required to play active roles in international business. It is our hope that the program will produce genuine global business leaders equipped with profound insight into economic, social, and corporate issues around the world, lofty aspirations and real passion, and the initiative to tackle challenges head-on. 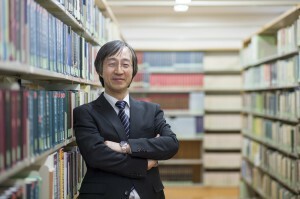 The Shibusawa Scholar Program is operated in line with the fundamental educational principles of the Faculty of Commerce and Management: the acquisition of broad-based, in-depth knowledge in the social sciences, and the practice of small-group education revolving around the seminar class format. The program’s curriculum aims to instil students with the international outlooks essential for leadership across many fields in both Japan and beyond. We encourage students first to make use of the intellectual training and intensive discussion offered in the faculty’s existing major courses and seminars, developing habits of profound reflection that enable comprehension of the logic in creation and development of business systems, and the mechanisms that lie behind them. Building on these foundations, students take classes to develop skills in English communication, together with more specialized courses in commerce and management taught in an English medium, thereby acquiring both input- and output-related skills in English. We anticipate that students will use the experience of long-term study abroad to develop the communicative skills required to give presentations in English on their own research topics. We also hope that they will make the most of opportunities such as internships at companies and other organizations outside Japan, and international forums for interaction with other students. It is our expectation that this diverse curriculum will produce Global Captains of Industry who can contribute through business to economic and social advancement in Japan, throughout Asia, and across the world. We look forward to the active involvement of students in the Faculty of Commerce and Management.